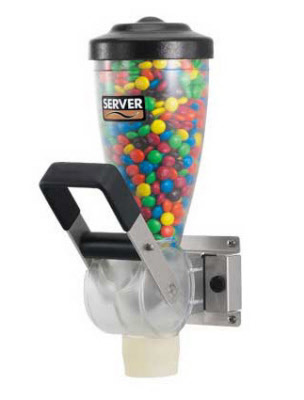 Server Dry Product Dispensers are designed to portion products like smoothie powders, iced coffee powders, mix-ins for blended ice cream drinks and cocktail powders. Consistent product that is not much bigger than ½-inch (1.3 cm) in diameter work best. 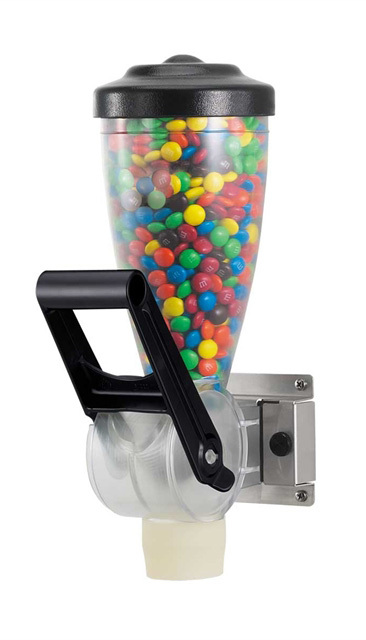 Products that stick together at your ambient room temperature, such as crushed candy bars, will also stick together in the dispenser and are not recommended. Very fine powders such protein and malt powders have the tendency to bridge inside a dispenser. The addition of a Free Flow Kit 86625 can solve this problem. However, the Free Flow accessory is designed for use in Dry Dispensers with a 2-Liter capacity such as the 86680. This item is not a 2-Liter capacity server.